This ecologically orientated renovation project demonstrates the importance of setting environmental priorities and staging work over time to suit client needs and budgets. The Sustainable House Builders’ holistic ethos assisted with establishing these priorities and achieving significant environmental and social improvements. The Client Brief: The existing four bedroom house was a deep plan, brick veneer building built in the 1980’s after the federation style. The house had some poorly located rooms in terms of solar aspect, which when combined with small eaves and limited ventilation openings required extensive use of air-conditioning to make the house habitable in the warmer months. The client had a rather vague brief; as well as some renovation work to the existing house. They were looking for some ideas to address a poorly utilised outdoor area with a south westerly aspect attached to the informal living area. The site was large, but despite featuring a pool and tennis court the outdoor areas were largely underused as there were no comfortable outdoor spaces nor connectivity for entertaining or for the children to play in. The design team recognised that the process of establishing the client brief was one of the most important phases of the project. They took a holistic approach that considered the family’s present and future needs and financial capabilities. Considering how best, a small renovation could improve the overall performance of the house. The result was a staged proposal. Stage one addressed the outdoor area with a large verandah extension adjacent to the house, some rainwater collection, and minor renovation of some of the upper level bedrooms. Stage two introduced a thermal chimney/ atrium into the centrally located stairwell which provides light and ventilation to the deep plan house, as well as the addition of more rainwater storage, a solar hot water system and insulation to the roof and walls. Stage three will see the implementation of permaculture gardens using greywater irrigation and a new ‘living wall’ to protect the upper level bedrooms from the western sun as well as to protect the bathroom and provide it with ventilation opportunities. Construction materials: The pavilion-like pergola extension is predominantly constructed in a combination of steel, for primary structural elements,locally sourced recycled hardwood timber and laminated plantation pine beams. High level battens are completed in a proprietary composite material manufactured from recycled plastic and sawdust that is expected to require little or no maintenance. Drop-down plywood feature panels mark the location of the outdoor dining table and provide a ceiling to frame the space into which compact fluorescent lighting is recessed. Shading: The existing house was poorly shaded to the south and west, with no significant vegetation and limited eaves overhangs. The extension provides protection to the family living areas which open out onto it from the harsh west sun. The pavilion roof provides upper level shelter whilst opening to the north allowing in desirable low oriented winter sun. Landscaping and ‘living walls’ have been used and proposed down the western side of the house to provide further protection. The north east of the house is protected by an existing verandah and some significant trees. The plywood drop panels have been positioned to the south-eastern side of the pavilion extension, to maximise winter morning sunlight. The mass shading provided to the house has also created a lot more visual privacy. As a result the house can be opened up and outdoor areas can be used without onlooking or overlooking neighbours. Ventilation: The existing house featured French windows but was poorly ventilated. While there are plans in future stages to further address this, the stage one renovation made a huge difference by just opening up the back wall with a large bifold door. This has enabled air to be pulled and directed right through the house from all areas of the ground floor as well as forcing ventilation into the upper level circulation area. The effect is further enhanced by the sustainable home design of the verandah extension; the high edge of its roof sits over one metre above the existing house roof ensuring that hot air can be expelled. The second stage of work proposes a thermal chimney over the central stairwell. This will draw air from the open planned informal living areas on the ground floor. Cooling Systems: The existing air-conditioning unit sits in the middle of the wall of the existing dwelling at the edge of the extension. Previously, not only did it have to cool an unprotected sizable area, subject to the full force of the western sun, with the unit itself was subject to that same western sun thus working very inefficiently. On the result of a cost analysis and availability of an alternative location, the unit has remained institute. Being now incorporated into a battened enclosure which screens both the unit and the associated pipe work. Acting now primarily as the main serving bench for the verandah entertaining space. The shading provided by the pavilion of the pool, allows maximum evaporative cooling whilst uncovered via the full opening of the bi-folding doors to the internal living spaces. 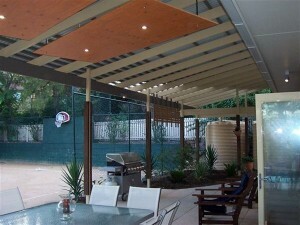 Subsequently, since the addition of the pavilion extension by sustainable house builders, the residents have not found it necessary to turn the air-conditioning on, even during peak summer periods. The choice of floor material being masonry pavers, provides valuable thermal mass for cooling the home with summer shading, as well as providing passive heating of the adjacent living spaces by slow release of great winter sun solar gain. The rain water tanks provide substantial thermal mass properties also by shielding and cooling of the direct pavilion environment. Lighting: A complete audit of the home’s lighting was conducted so that the house could be fitted with more energy efficient lighting layout. The introduction of the daylight into the centre of the deep plan house through the proposed thermal chimney/atrium will reduce if not eliminate the need for artificial lighting during the day. The inspiration of this passive lighting benefits not only the central circulation areas but most importantly flooding the upper level of the home with priceless energy neutral light and ventilation. Artificial lighting for the extension is all from 240v compact fluorescent globes and provides alternative lighting for the tennis court that reduces the need for the power thirsty court lights when the area is being used for general play by the children. Rainwater: Three rainwater tanks with a total capacity of approx. 15,000 litres total have been installed as part of stage one. They are located to the west of the outdoor space helping to buffer the afternoon sun. The tanks were plumbed to the house ready to be connected to all services inside the house as part of a later stage of works. At the moment the collected rain water is being used for wash down, irrigation purposes and for pool top up. There was also another tank installed towards the other end of the property next to the garage structure, this bringing the total rainwater storage capacity of the site to approx. 28,500 litres. A pool blanket was installed to reduce evaporation, provide solar heating and reduce heat loss whilst minimising fossil fuel energy use for sanitising the water. Landscape: One of the main features of this renovation was the integration of the landscape into the design. The colorbond roof cladding of the verandah, has been phased in the southwest corner with polycarbonate sheeting, buffering harsh summer sun as natural filtered light through random under battens. A pleasing feature allowing the garden to thrive as it extends well beneath the protection of the roofline. Tensioned steel cables, ladder from the landscape to the roof structure allowing for vines to climb into the structure itself. The intent is to act as a living, active, cooling corner within the outdoor space, serving to filter and cool breezes for both direct external and internal air quality and temperature. Garden beds to the extended edge of the extension assist in filtering out the dust which filters off the crushed granite tennis court. As part of stage three a deciduous vine will be incorporated into a ‘living green wall’ which will protect the children’s rumpus room minimizing artificial lighting by shedding it foliage to allow in desirable winter sun. There has been a focus on productive gardens and where possible vines and edible plants have been chosen. The vines as part of stage one are passionfruit and the intention is to provide a raised vegetable garden down the side of the house as part of stage three. The principle focus of the sustainable home designs team on passive design, incorporating total integration of landscape, achieved through microclimate control, has greatly improved occupant comfort whilst achieving a massive reduction in the use of fossil fuel sourced energy. Water harvesting and water conservation strategies enable maintenance of the thirsty pool for summer comfort refuge whilst providing the potential to meet new stringent water usage targets. The social connectivity and interaction inspired by natural and passive elements of the pavilion structure has undoubtedly improved the comfort, health and quality of family life.